To come together in ONE place. A Community of differing perspectives. A Community that’s Anti-Hustle and Anti-six figure talk. A Community of Families, of all definitions. A Community that will support & cheer you on, but also hold you accountable. A Community that will be here when your family & friends aren’t. A Community that supports a “whole life” approach in integrating your life & business, not trying to balance them. Are you ready to become a part of the movement? You will need to dive in, and take action. To not just work harder, but work smarter. To have the tough conversations, with yourself AND your family. To be patient, since this won’t happen overnight. To take accountability for your actions. To challenge yourself, each & every day. To accept that you will fail. To learn from your failures, and grow. We will lead you, but we can’t do it for you. We will help you block out all those messages of what you “should” be doing. We will tell you what you need to hear, not just what you WANT to hear. We will give you tough love when you need it, and encouragement when you’re down. We won’t pressure you to buy anything that won’t help you on your journey. We will guide you along on a path towards a better life for your family. Because entrepreneurs can’t survive on just success. They survive knowing they’re doing the right thing, and providing for their family. They survive with a community of like-minds to support them. Because a collective is always greater than an individual. 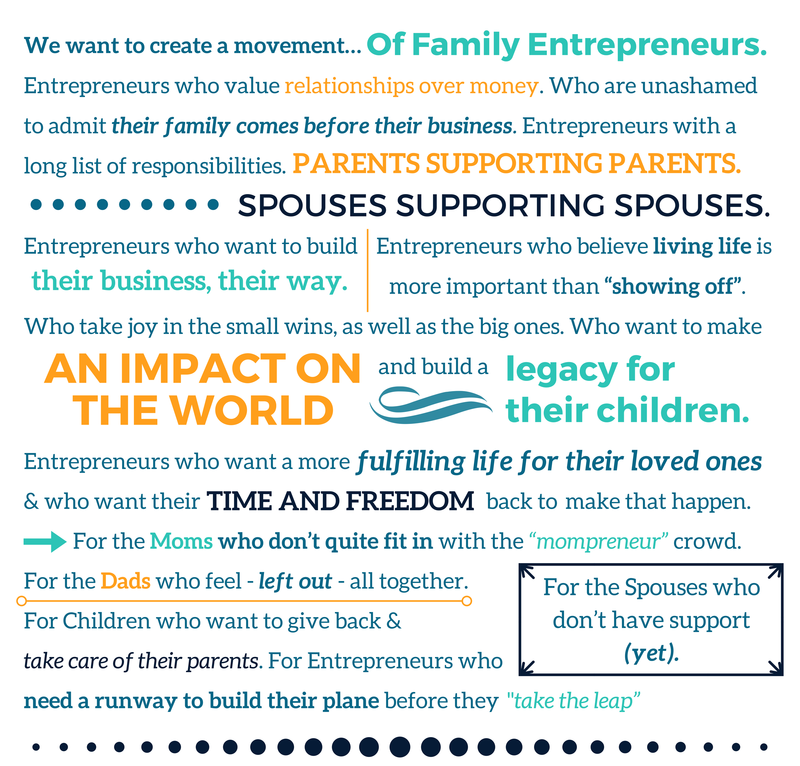 Join the Family Entrepreneur Life Community!